Whenever we go out to eat, my other half always chooses chicken wings if they are on the menu so when he decided to make a valentines meal on Friday, he thought he would try and make his own from a recipe he saw online. 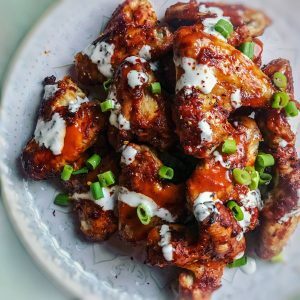 Since then I’ve adapted the recipe further to suit my own tastes and Weight Watching needs and it is just as delicious (and much nicer than any wings I’ve had in a restaurant)! You can make the marinade ahead of time and marinade the chicken wings for a few hours too. I tend to do that when I’m organised enough or remember to defrost the chicken the night before (which isn’t often). Pop your oven to 200c. Take a large bowl and mix the mustard, soy, honey, Worcestershire sauce, ketchup and spices and give a stir. In a separate large bowl add the chicken wings, sprinkle over the flour, season with salt and pepper and then mix until the chicken is well coated. Add the chicken to the bowl with the marinade and coat well in the sauce. Spray a baking tray with 1kal and then lie on the tray in one layer. Roast uncovered for 25-30 minutes until nicely browned and sticky (turn the wings over half way through). Serve on top of a nice bed of green salad, season and garnish with spring onion and a splatter of buffalo sauce, soured cream and lime juice.